Friendly Del Mar neighborhood eatery, popular for live music. 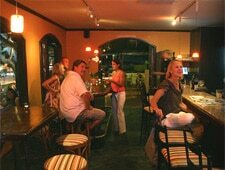 : Zel's name pays homage to owner Greg Glassman's legendary grandfather, who settled in Del Mar. It's a casual, friendly place, the epitome of a neighborhood eatery. Enjoy al fresco dining by the cozy fire pit or a lively bar scene inside. The California coastal cuisine is engaging for the most part. Start with crispy fish tacos with jalapeño white sauce or the ahi crab stack in a yuzu vinaigrette. Burgers and flatbreads anchor the menu with nice pizza choices like Nova smoked salmon with red onion, dill crème fraîche and fried Sicilian capers or the spicy sausage. A few dishes simply have too many flavors competing at once, as is the case with the chicken confit flatbread pizza with asparagus, avocado, arugula, truffle oil and lemon --- the truffle essence gets lost in the shuffle, but the crust is good. Entrées vary from Prime pork chops and venison meatloaf to local white sea bass with sweet corn succotash and roasted red peppers. Look for half-off flatbreads on Tuesdays, and half-priced wine bottles on Wednesdays. Happy hour runs daily. Live music Thursday through Saturday and an open mic on Sunday.